Gold Hammered Gold Plastic Soup Spoons 20ct. Home»China-like Tableware»Hammered Collection - Various Colors»Hammered Collection - White w/ Gold Hammered Border»Hammered Collection 7" White w/ Gold Hammered Border Salad / Cake Plastic Plates 10ct.»Gold Hammered Gold Plastic Soup Spoons 20ct. Color:Gold Hosting a party or Planning a Wedding? Change the look of your table and awe your guests with these Elegant Hammered Designed Gold Cutlery. With its fine Elegant design this Cutlery set is sure to bring your event to the next level. Quit the hassle of washing dishes go green go Disposable a luxurious look of Real Silverware at a fraction of the cost Great for weddings, Receptions, Birthday parties, Baby showers, holiday and family gathering, or any Catered special event. Heavy-weight & Durable: Strong and sturdy plastic silverware that is high quality and look like a real cutlery. Beautiful gold flatware that is ideal for any event such as catering, dinner, weddings, holiday parties and more. These will add a nice touch and class to your dining table. Convenient & Functional: This silverware set will save you a lot of money and time when having big formal events such as wedding receptions, catering services, banquets and other special occasions. The gold embellishment incorporates sophistication and elegance to any conventional table set up. Disposable & Reusable: These silverware sets are made for easy disposal but can also be reused. Wash them afterwards to use it again and they will still look great. Economical and practical at the same time. Highly recommended if you want a classier look on a small budget. Gold Hammered Gold Plastic Forks 20ct. Gold Hammered Gold Plastic Teaspoons 20ct. Gold Hammered Gold Plastic Knives 20ct. More From Hammered Collection 7" White w/ Gold Hammered Border Salad / Cake Plastic Plates 10ct. 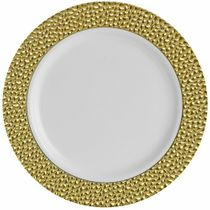 Hammered Collection 10 1/4" White w/ Gold Hammered Border Banquet Plastic Plates 10ct. 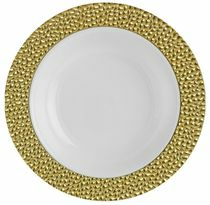 Hammered Collection 9" White w/ Gold Hammered Border Luncheon Plastic Plates 10ct.